Over the years Mayor Daley has proven to be a master at blaming the city's budget woes on someone or something other than himself. Usually it's the federal or state government, but this time around he has an even bigger bogeyman to blame: it's the economy, stupid. "It's very simple—there's a huge recession in the country," he said at the outset of his August 19 budget hearing at Falconer Elementary School on the northwest side. "The economy is slowing down because of bad credit. It's very difficult for young people graduating college—no one's hiring." His astute economic analysis is correct, as all indicators show. Condo and home sales are down, hotel vacancies are up, unemployment's rising—even law firms and investment firms, once the busiest portion of our booming service sector, are cutting back. 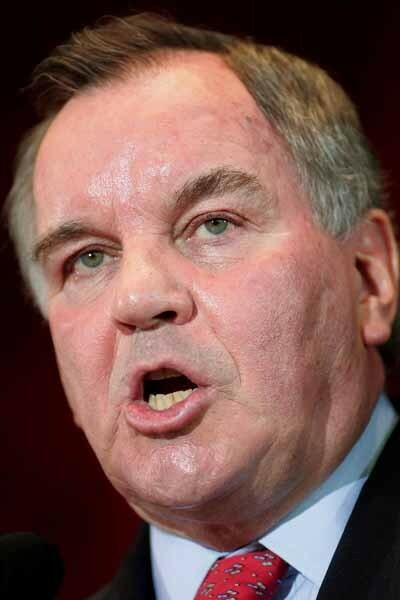 Things have gotten so bad that even Mayor Daley realizes he can't raise property taxes again. And there's only so much he can squeeze out of fees and fines. As a result, he says, he doesn't know how the city will cover its most basic expenses—fire, police, garbage collection, snow removal. Moreover, there's no immediate relief in sight. "This recession will be about three years—to 2011," the mayor predicted at Falconer. "That's going to be a long time." And what does he intend to do about it? Apparently he's hoping to spend his way out of the doldrums, via the Olympics. "The way out of a recession is infrastructure spending," he said. "If you don't it's going to be a real crisis in America." As the New Deal showed, that's actually not such a bad idea—if you're the president, with the full U.S. treasury at your disposal. Of course, it's a little riskier if you're a mayor drawing mainly on property taxes too many of your constituents can't afford to pay. As Daley himself put it, as mayor "you can't print money, and you must balance your budget." I would say it's panic time, except I learned long ago to be skeptical about anything city officials tell us. And the budget is just a projection, the city's estimate of what it will take in over the next year versus what it will spend. It's far more subjective than the mayor pretends, more a matter of politics than economics. In 2006, when Daley was gearing up for his reelection campaign, he proudly proclaimed that thanks to his vision and leadership the budget was balanced and no new taxes would be needed. But lo and behold, once he was reelected, he discovered that the city was facing a $217 million deficit that could only be covered by raising fees, fines, and $83 million in property taxes. 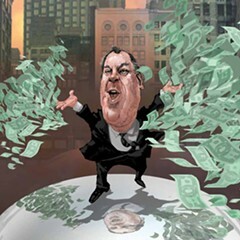 This time around he says he's facing an even greater deficit—$420 million—but that he won't raise taxes. Why not? He says it's because he knows home owners are paying too much—which they are. But a number of aldermen I spoke to off the record figure he doesn't want to ignite a backlash as he prepares to submit the city's bid to the International Olympic Committee next year. Besides, property taxes will continue to rise no matter what the mayor says, thanks to his best friend, tax increment financing. As you may recall, every time the City Council—at the mayor's urging—creates a TIF district, it freezes the amount of money the schools, parks, county, and other taxing bodies can take from these areas. To compensate for the money they're not getting because it's being funneled into the city's 160-some TIF districts, these taxing bodies have to raise their rates, and your property taxes (or your rent, if your landlord passes the cost off to you) go up. In many ways the entire budget process—starting with this hearing and concluding with the City Council's approval in November—is little more than a three-ring circus in which the mayor, the aldermen, reporters, and the public passionately wrestle over the portion of the budget that's out in the open. The mayor vows to hold the line on spending while TIFs grow at a rate of roughly 30 percent a year, bringing in hundreds of millions of dollars Daley is free to spend as he wants. I'm amazed that he still gets away with it. So the hearing at Falconer—like the ones held at a west-side senior citizen center and at the South Shore Cultural Center last week—was really a dog and pony show. 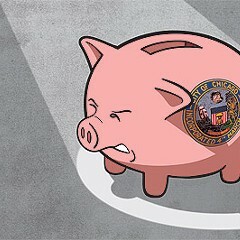 The mayor wasn't going to drop any bombshells or tell the whole truth about city finances. He either hasn't figured out how he's going to close the budget gap yet or he has but doesn't want to tell anyone at the moment. He's got everyone from aldermen to union leaders guessing what comes next, and apparently that's fine with him. Still, the hearings can be entertaining. For one thing, the city gives goodies away at the front door, though this year's handout—a Blue Bag—was pretty skimpy. No bike maps, pencils, pens, or key chains as in years past. As always, the hearing was a command performance for the 40 or so members of the mayoral cabinet. All the big shots—planning commissioner Arnold Randall, parks superintendent Tim Mitchell, police chief Jody Weis, fire commissioner John Brooks, budget director Bennett Johnson III, and library commissioner Mary Dempsey—attended. Chief financial officer Paul Volpe and Weis got the prized seats next to Daley. Then the little people of Chicago got to address their mayor. One by one they stepped to the microphone to plead for their favorite programs. Clearly, most of them had decided that if you want funding for your park, library, or health clinic, it's important to butter up the mayor—tell him the city never looked cleaner, remind him of all the wonderful things out-of-town visitors say about Chicago. Never mention the CTA, but by all means say the Olympics is a great idea—some people may even believe this. From time to time someone would ask a sharp question. For instance, Logan Square resident Mark Heller asked about the future of the Central Loop TIF, which is set to expire at the end of the year..
Daley, with a straight face, told him that TIFs are "used for schools, parks, and libraries, 99 percent." It was an outrageously erroneous statement, as any of the residents begging the city to build play lots can tell you. (The current Park District policy is to make locals raise most of the money themselves.) Go to any monthly meeting of the Community Development Commission, the mayorally appointed body that oversees TIFs, and you'll see it OK subsidies for shopping malls, hotels, condos, private hospitals, car dealerships, you name it. At their last meeting, on August 12, the commissioners recommended forking over about $25 million to some developers who want to build a shopping mall in Little Village. Care to comment? Find this column at chicagoreader.com. And for more on politics, see our blog Clout City. As the city faced a gaping budget deficit, the Daley administration closed out Chicago’s oldest and fattest slush fund by spending every last cent in it—and then some.